The "store-bought" sewer line supports or sewer drain hose support are great if you find one that fits perfectly for the height of your sewer outlet. They are a little pricey and some of them are not very durable. The Niagara sewer outlet is pretty low to the ground, so making your own support and custom fitting it to your needs, and being able to do it for less than $20 just may be the way to go. This idea was borrowed from a fellow camper and has worked out very well. 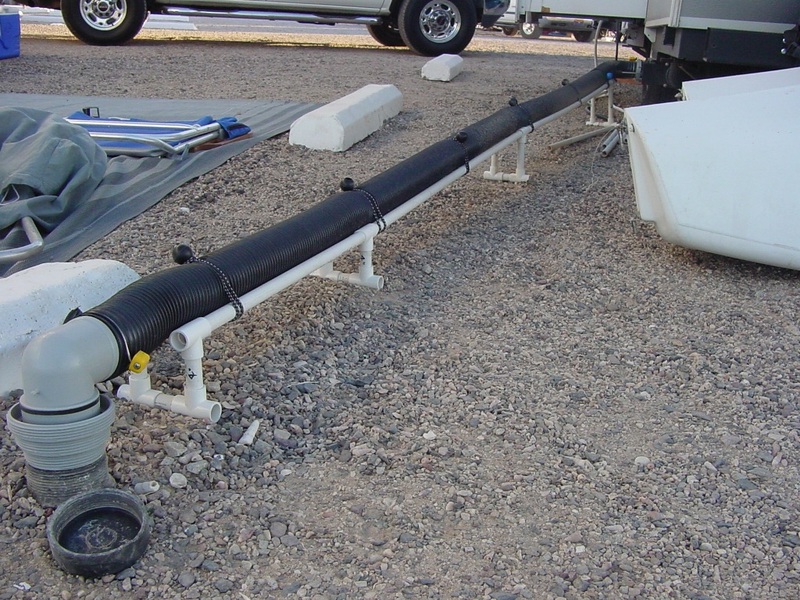 This system is made of 1/2" PVC pipe and Tee fittings. As you can see in the photo (click on it to make it larger), the basic bracket is made up of 4 Tee fittings and lengths of pipe. Several different lengths of risers were used to get the desired effect. The photo shows brackets with 8", 6" and 4"' risers. There are a couple of other lengths in my kit but these are the ones I use the most. Nothing is glued together to make it easy to change out the riser pieces, if need be, and makes life easier if adjustments are needed. I carry several different lengths of pipe to connect the brackets together. A couple of pair of 6-footers, a couple of pair of 4-footers, and a pair of 2-footers cover most situations. I carry a spare piece of uncut pipe just in case I have to make a "custom" length. Using a few bungee balls to hold things together is the only other thing needed.